1. Preheat the oven to 220°C, gas mark 7. Heat ½ tbsp oil in an oven-proof frying pan. Carefully place 150g Waitrose Select Farm Salmon Fillet in the pan, skin-side down, and cook for 1 minute. Transfer to the oven and roast for 10 minutes. 2. Peel and finely chop ½ small onion. Soften in a pan with 1 tsp oil, then add 75g shredded curly kale or spring greens or Savoy cabbage. Wilt for 5 minutes, then stir in 1 tbsp essential Waitrose Half Fat British Crème Fraîche and 1 tsp creamed horseradish sauce. 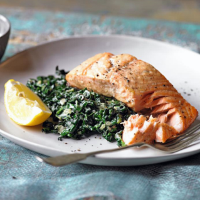 Serve the fish on the greens, garnished with a large wedge of lemon and a little black pepper.